Of the six men who have portrayed the famous spy, some would argue that Craig is the best Bond yet. He certainly is different than we have seen in the past. James Bond is one of the most iconic and enduring characters in cinematic history. Fans of Albert Broccoli's creation anticipate a new release and are anxious to own each film in the catalog when they become available for home theater. The twenty-fourth film in the franchise hits stores today, and it will, no doubt, be as popular as its predecessors. Spectre shows us a much more contemplative Bond (Daniel Craig; The Girl With The Dragon Tattoo), as he reminisces about the loss of his childhood home and the death of M (who sent him on one last assignment from beyond the grave). As with all the 007 films, this one sends Bond around the world – Mexico, Italy, etc. – battling bad guys and saving the (Bond) girl, in this case, Madeleine (Lea Seydoux; Inglorious Basterds). This movie also includes the villain, Blofeld (Christopher Waltz; Inglorious Basterds), who, it turns out, Bond thought was dead years ago. Of the six men who have portrayed the famous spy, some would argue that Craig is the best Bond yet. He certainly is different than we have seen in the past. His Bond, while still debonair, is a little rougher around the edges, alluding to the idea that his less than ideal childhood disturbed him more than other actors have let on in the past. He certainly was a strong choice to continue the legacy, and he doesn't disappoint in this latest installment. Supporting Craig is a group of solid actors including Waltz, who plays the villain perfectly. Seydoux is a strong Bond girl, perhaps one of the emotionally strongest we've ever seen. Ralph Fiennes (Harry Potter and the Deathly Hallows Part I and II) does an admirable job stepping into the role of M. I'm not sure he is an improvement over Dame Judy Dench, but he doesn't stand out in a bad way. Also, a nice addition to the cast is a young, tech savvy Q, played by Ben Wishaw (The Danish Girl). The Blu-ray is presented in 1080p High Definition video with a 2.38:1 aspect ratio. This makes every scene sharp, and truly enhances the beautiful surrounds they shot as well as the Dia De Los Muertos parade they shot in Mexico City. The DTS-HD Master Audio 7.1 is perfect to enhance the video and match the story. Every explosive boom sound is spectacular and the dialogue is crisp and clean. The biggest disappointment on the Blu-ray is the extras, or lack there of. There are several video blogs, but those are the same ones that were posted on YouTube as a teaser during production. The only additional extra is a 20 minute look into the filming of the opening sequence and all the detail and coordination it took to manage the 2000 extras in the parade. While I enjoyed the segment, I just wish there would have been more like it. In the end, you really can't go wrong with a 007 film because even if you aren't all that interested in the plot or don't like the actor that was chosen to play Bond, it's still a James Bond movie and, as a whole, they tend to be entertaining. This is one franchise I don't see going anywhere any time soon, as it seems to garner a new generation of fans every time a new film hits theaters. 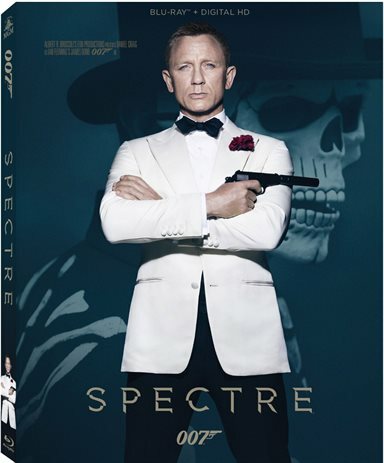 For those who are already die-hard fans, Spectre is one you should add to your home theater library. Download Spectre from the iTunes Store in Digial HD. For more information about Spectre visit the FlickDirect Movie Database.